Description Are you sick of rotten recruitment agencies and their empty promises? Get your revenge on these crooked consultants by dropping them into the creature infested custard! With sharks, crocodiles, and piranha patrolling the waters, we can guarantee that none will emerge alive! 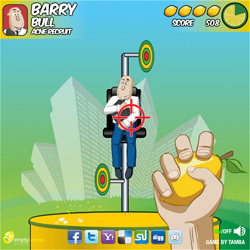 Hit all the coloured targets on a level to activate the deadly dunking machine! If you miss four times, or the timer runs out, it's game over, so aim fast and true!